Som bekant har IEA under en följd av år trummat in budskapet att effektvisering är en resurs som underskattats (se bild nedan). 2017 höjde man röste ytterligare och sade att vi nu står vid en skiljeväg och att det behövs mera krafttag från regeringarna. Ta reda på vad de menar genom att lyssna in på webinariet den 22 mars! 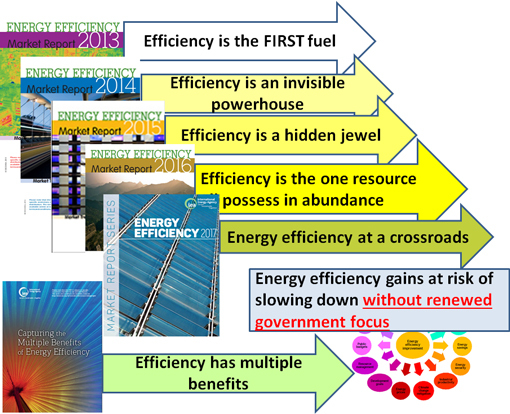 The IEA collects and analyses data to determine key international trends relating to energy efficiency. At the forefront of this work is the IEA’s annual Energy Efficiency Market Report, which highlights key global trends and indicators of energy efficiency. The 2017 report, entitled Energy Efficiency 2017, also includes analysis on energy efficiency policies and finance, trends in major economic sectors, the impact of energy efficiency on energy security and a special country focus on Indonesia, the largest energy consumer in Southeast Asia. This presentation will discuss the key findings from the 2017 report, including the major benefits from efficiency to economies, households and the environment. Skriven av Hans Nilsson, 05:57 AM.